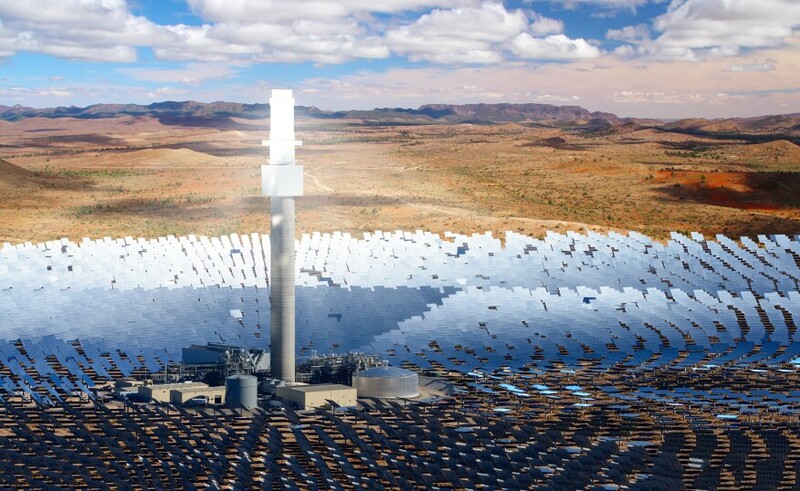 South Australia to Build 150-Megawatt Solar Thermal Power Station | "Global Possibilities"
SolarReserve signed a Generation Project Agreement with the State Government of South Australia this past week. On Aug. 14, Santa Monica, Calif.-based solar power company SolarReserve signed a Generation Project Agreement (GPA) with the State Government of South Australia to build a 150-megawatt solar thermal power station near Port Augusta that will utilize the company’s solar energy technology in conjunction with molten salt energy storage—a thermal energy storage medium. Dubbed the Aurora Solar Energy Project, the power station will be capable of storing 1,100 megawatt-hours of energy in order to meet the area’s electrical consumption needs. ““The Port Augusta story is a stark example of the transition of the South Australian economy, with the closure of a dirty coal fired power station, and now the commissioning of this world leading renewable energy project,” said South Australia’s premier, Jay Weatherill, in a press release. Other than providing power, the station will also provide job opportunities in construction as well as facility maintenance and operations—giving jobs to those who have experience in operating coal and gas power stations. “We are using our energy plan to drive investment and jobs in this growing sector,” said South Australia’s energy minister, Tom Koutsantonis, in the release. Selin Ashaboglu is an assistant editor of products and technology for ARCHITECT and Architectural Lighting. She graduated from Wheaton College, Mass., with a bachelor’s degree in English, and minors in Journalism and Studio Art. In the past, she has contributed to Time Out Istanbul, and copy edited for the Smithsonian Institution Scholarly Press.